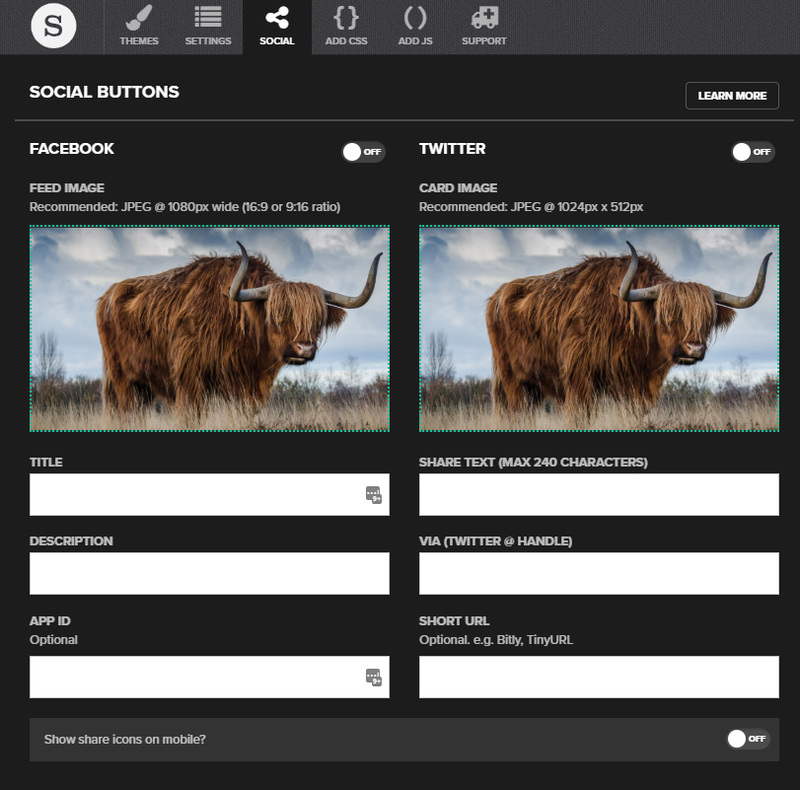 There are a couple of simple steps to add Twitter and Facebook share buttons to the header of your story. These allow your readers to easily share your story with their own followers by posting a link that includes the story title, description link and an image. You can choose to show buttons for Twitter and Facebook. Both are optional. 1. In order that your social buttons can contain links to your story, you need to provide the URL at which the story will finally be hosted (this isn't necessary if you are hosting your story with Shorthand). At the top of the page in the story editor, click the "SETTINGS" icon. This will expose the settings panel, into which you need to provide the full URL of where the story will be hosted (ensure you include http:// or https:// at the beginning). 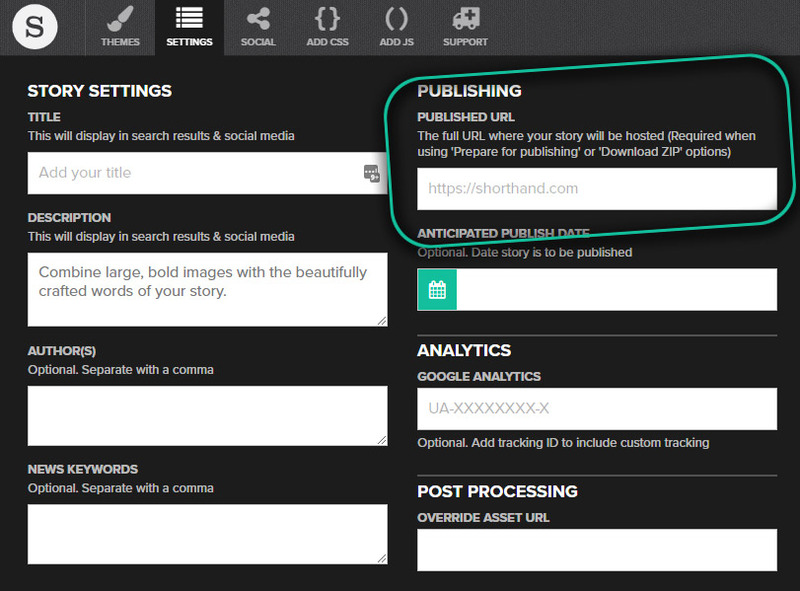 If you don't yet know where the story will be hosted, you can do this step later - at any point before publishing. 2. To set the image, title and description etc that will be shared, at the top of the page in the story editor, click the "SOCIAL" icon. Switch the toggles for one or both of the columns for Facebook and Twitter to the "on" position, provide the necessary information and, if you wish, add a custom image. Show share icons on mobile? If you'd like the Twitter and/or Facebook buttons you have activated to show on a mobile device you need to set the toggle to 'on'. Note that once you have, there will be a bit less space at the top of your story for your logo – you can use the Preview function to check the experience on mobile, and upload an alternative logo for mobile if necessary. If you'd like to connect your story to a Facebook App ID please enter the ID here (this is available via Facebook Developer accounts and it optional). The title you'd like to be used by Facebook. If left blank Facebook will use the Title added to the Title section, unless a Title for the page has been added via Settings, in which case it will use that. If no title is added to the Title section, Story Settings or Sharing, the title in Facebook shares may be left blank or filled in with text from elsewhere in the story. The description you'd like to be used by Facebook. If left blank Facebook will use the subtitle added to the Title section, unless a description has also been added via Settings, in which case it will use that. If no subtitle is added to the Title section, and no description has been added to either Story Settings or Sharing Setup, the description in Facebook shares may be left blank or filled in with text from elsewhere in the story. We offer Twitter and Facebook sharing buttons as standard, but can quote for custom work to add other buttons. Contact us if you'd like to find out more.